AWI is the lead organization coordinating a team effort for the Upper Sangamon River Targeted Watershed Project. This 3-year project received a $1.3 million EPA grant to study ways to manage agricultural nutrient inputs efficiently – AWI’s first major research grant. 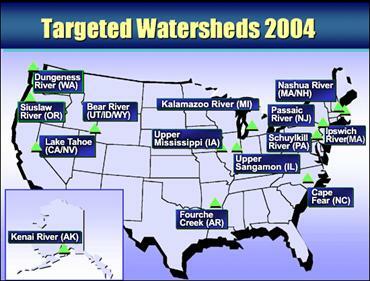 Targeted Watershed projects must be nominated by a Governor. This EPA map shows the 14 projects selected in the 2004 round of grants. The project includes two separate types of nitrogen field trials, called the Nitrogen Rate Trial and the Information Technology Trial. Producers may enroll fields in the Upper Sangamon Watershed in either study. Cooperators will receive incentive payments. Producers in the N Rate Trial may purchase a net income guarantee to cover economic risk. For the IT Trials, producers must have access to GIS and GPS technology and fertilizer and yield monitors. These dispersed field trials will test yield and net return from varied fertilizer rates and practices. Another study in the Upper Sangamon project will demonstrate drainage water management and subsurface bioreactors to reduce movement of nitrates through drainage tiles to surface waters. Economic and environmental benefits of soil testing and variable rate technology for phosphorus will be studied in paired watersheds in Champaign County . technical service providers in the fertilizer industry. This project is part of a large and diverse effort to develop effective, voluntary strategies to reduce harmful levels of nutrients in the Mississippi River Basin and the Gulf of Mexico . Alternative cropping systems, including the perennial grasses to be considered in our biomass energy project, are another component. AWI is well positioned to play an important role in research to find innovative ways to protect water quality without hurting farm income.